The Gloster Gladiator (or Gloster SS.37) was a British-built biplane fighter. It was used by the Royal Air Force (RAF) and the Fleet Air Arm (FAA, as the Sea Gladiator variant) and was exported to a number of other air forces during the late 1930s. The Gladiator was the RAF's last biplane fighter aircraft and was rendered obsolete by newer monoplane designs even as it was being introduced. Though often pitted against more formidable foes during the early days of the Second World War, it acquitted itself reasonably well in combat. The first version, the Gladiator Mk I, was delivered from July 1936, becoming operational in January 1937. The Mk II soon followed, the main differences being a slightly more powerful Mercury VIIIAS engine with Hobson mixture control boxes and a partly automatic boost control carburetor, driving a Fairey fixed-pitch three-blade metal propeller, instead of the two-blade wooden one of the Mark I. The Gladiator saw action in almost all theatres during the Second World War, with a large number of air forces, some of them on the Axis side. The RAF used it in France, Norway, Greece, the defense of Malta, the Middle East, and the brief Anglo-Iraqi War (during which the Royal Iraqi Air Force was similarly equipped). Other countries deploying the Gladiator included China against Japan, beginning in 1938; Finland (along with Swedish volunteers) against the Soviet Union in the Winter War and the Continuation War; Sweden as a neutral non-combatant (although Swedish volunteers fought for Finland against USSR as stated above); and Norway, Belgium, and Greece resisting Axis invasion of their respective countries. Portugal was another operator of the Gladiator, and its service with the Aéronautica Militar (Army Aviation) lasted well beyond the 2nd World War. Initially, the Portuguese Government ordered fifteen Gladiator Mk. IIs in July of 1938. Gloster supplied them as kits to Alverca in Portugal, where they were assembled in September 1938. The machines we4re allocated the serial numbers 450 to 464 and formed half of the Esquadrilha de Caça (EC for short: fighter squadron) at Ota, with ten Junkers Ju 52/3m G-3E bombers forming the rest of the squadron. Portugal attempted to purchase more modern fighter equipment from the United Kingdom, but RAF orders had priority and so fifteen more Gladiator Mk. IIs were ordered, diverted from an RAF contract. These were assigned serials 465 to 479 and formed a new EC at Tanco. In early 1941, US President Franklin D. Roosevelt stated that the Azores Islands "represented the eastern frontier of the United States". The Portuguese-held islands were an ideal operating base for Allied surface ships and maritime reconnaissance aircraft, since these forces could combat German submarines operating in the mid- and south Atlantic Ocean from the Azores. On the other side, there was also the imminent danger of a German occupation — an intent of German strategists through 1941 was to seize the Azores as an ideal base for the trans-Atlantic ranged Amerika Bomber project, for direct attacks on the US east coast. Anyway, Portuguese concerns about an Allied takeover appeared more realistic and prompted the government to deploy air and naval units to the Azores. The Aéronautica Militar consequently formed Esquadrilha de Caça Expedicionara No. 1 dos Azores (1st Expeditionary Fighter Sqaadron of the Azores) in June of 1941. Their fifteen Gladiators were immediately deployed to Rado de Peize on San Miguel Island in the Azores. Soon afterward, Esquadrilha de Caça Expedicionara No. 2 dos Azores was formed to fly Gladiators from Tejas on Terceira Island. By late 1943 , the Gladiators were obsolete as front line aircraft and were replaced in the Azores by Curtiss P-36 "Mohawks". British-supplied Hurricanes and Spitfires replaced Gladiators in Portugal-based fighter units. But the type was not retired: in 1948, several Gladiators returned to the Azores as Esquadrilha de Caça No. 3 at Lajed, where two of them were converted into floatplanes with a large central float plus smaller outrigger floats under the wings. These were the original aircraft “461” and “464”, but among the crews they were better known under their nicknames “Tubarão” (shark) and “Toninha” (harbor porpoise), represented by nose art paintings under the machines’ cockpits. Further modifications of these floatplane Gladiators included a new, reversible three blade propeller for easier handling and a ventral strake for improved stability. The underwing machine guns were removed and replaced by shackles for light ordnance - including containers with life rafts, but also flares or small caliber bombs - added. The fuselage-mounted guns were retained, though, but rarely fitted since the weapons suffered heavily from the Ocean environment and the added weight cost performance and range. These unique machines were primarily used in general observation, weather reconnaissance and 'hack' duties, e. g. as document couriers between the Azores and passing ships. But this episode lasted only for two years: in 1950, the remaining aircraft (a total of seven were still airworthy) were returned to Portugal and served as advanced training aircraft at Tanco. Another entry for the “Old Kit” Group Build at whatfifmodelers.com in late 2016 – no such event would IMHO be complete without a vintage Matchbox kit, and the Gladiator dates back to 1973. Anyway, despite its age it is a very good rendition of the biplane, even with engraved details. The engine is well detailed, the fabric structure looks very good and not over-emphasized, just the cockpit lacks a dashboard and the clear canopy is only a single piece and utterly thick. 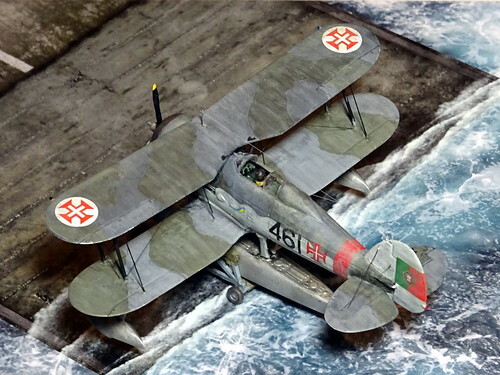 But the Gladiator would not remain an OOB build: inspiration for this literal “Sea Gladiator” dates back to a CG rendition of an FAA Gladiator on twin floats I came across while browsing the web for detail pics of the real aircraft (for a real world Hellenic machine). This looked pretty neat, reminding of a baby Fairey Swordfish, esp. with a typical FAA paint scheme. For a twin-float layout, a Hasegawa Heinkel He 51 B as donor bank lay ready in the kit pile. For a central float, I had a single float from a Matchbox Fairey Seafox in the spares box, together with a pair of stabilizer floats from a Matchbox Supermarine Walrus. I settled for the more unusual single float variant – because it would be different from the inspiring CG layout, and its more exotic look. The Walrus floats were too big, though, so I cut away a lengthwise 2mm “slice” (eliminating formerly drilled holes for toothpick struts; the floats were formerly used under a Mitsubishi Zero turned into a scratched Nakajima A6M2-N Rufe many years ago…) which gave an overall reduction in size that would match the compact Gladiator. The Seafox float was just perfect in size and shape, it even comes with nice surface details and a rudder, but had to be cleaned from masses of old enamel paint at first with a thorough foam oven cleaner bath (for several weeks…). The aircraft itself was built OOB, just with an added dashboard in the cockpit and the canopy cut into three pieces for an open position (in fact, the sliding part was totally left away). Under the lower rear fuselage a stabilizer fin was added and the OOB wooden propeller was replaced by a cuffed three-bladed alternative, IIRC from a Hobby Boss Grumman F4F Wildcat. Mounting the floats was more complicated. The streamlined struts were taken from a donor Eastern Express Blackburn Shark (reboxed vintage NOVO kit) and adapted to the new use. From the Shark I also took the longer exhaust pipes. Work started with the outriggers, both placed on two struts each, and once these were in place the central float was mounted on four pylons, putting it in a slightly “deeper” position than the outriggers and far enough away from the propeller arc. A lot of dry-fitting and trial & error was necessary to define the float’s and struts’ position under the Gladiator’s fuselage, as well as their relative length. Since the area in front of the cockpit is hard to reach once the upper wing is in place, some partial early painting was done in this area. The wings themselves are pretty easy to mount if you take time for dry-fitting and thorough drying of the sub-assemblies – but the real horror comes with the (optional) rigging! I did not want to leave the kit without this detail – it just looks much better with stabilizing wires, and these actually stiffen the kit! There are several methods/materials, including fine yarn, wire or fishing line. I tried all of these, and personally prefer heated and elongated, leftover sprues. The benefit is that the styrene is easy to glue and bonds well with the rest of the kit. Thin threads (which can be torn into individual strength) have innate stability, so that no tension has to be applied while trying to stick the stuff into place. And with the proper color of the styrene (e. g. in silver, black or grey), the wiring even looks pretty realistic in itself without any further paint, which, by tendency, can leave drops and simply makes the wires visibly thicker. I also scratched a beaching trolley, from styrene profiles, leftover parts from a ship display and wheels from the scrap box. Proper and stable hold of the aircraft model was later achieved through cushions made from paper tissue dipped in thinned white glue. A bit of “carte blanche”. While an FAA Gladiator would have been a nice and plausible option, I rather searched for something exotic – and found the Gladiator’s long career with the Portuguese Air Force well beyond WWII and the engagement of the type in the Azores. The archipelago location made a home-made floatplane conversion even more plausible. But I did not stick to the original Portuguese paint scheme – the real Gladiators were painted in a uniform dark green on all upper surfaces (and alternatively a RAF Dark Green/Dark Earth scheme, AFAIK), with light grey wing undersides. I created a fictional mix, with classic FAA colors (Dark Sea Grey/Extra Dark Slate Grey/Sky Grey) and a high waterline, plus counter-shaded, lighter upper surfaces of the lower wings, plus fictional Portuguese markings. The basic colors I used were Humbrol 224 and 123 on the top sides, plus FS 16473 (ADC Grey) from ModelMaster for the lower surfaces. The counter-shaded lower wings were painted with Faded Olive Drab and Dark Gull Grey (FS 36231) from Modelmaster. The floats were painted in a NMF – I was not certain whether to paint them with camouflage (either upper or lower scheme? ), and in order to underline the conversion aspect of the build I just left them without paint at all. I used Steel and Brushed Aluminum Metallizer (Modelmaster and Humbrol), and the result looks quite good. Some overall drybrushing was done to emphasize the surface structure, even though the rigging made things rather hazardous. The markings are conservative and minimal, mostly from a PrintScale aftermarket sheet for the Gloster Gladiator and from a Carpena “Exotic Spitfire” sheet. AFAIK, 3. Esquadrilha de Caça aircraft did not carry any squadron emblem – hence I invented the nicknames and the respective nose art (from a Revell Dassault Mystère with Patrouille de France markings). Another type in EC3 service, the Spitfires, featured an RAF-style 2-letter-squadron code (“XZ”, AFAIK) an individual letter for the respective aircraft, and a serial number. For the Gladiator I stuck to the original serial numbers, though, added the national markings on the fuselage and used re-arranged code numbers from an Irish Air Corps Spitfire on fuselage and under the wings. From the Spitfire the red fuselage band was used, too, it adds some color to the overall rather dull and simple aircraft. The rigged kit was carefully sealed with matt acrylic varnish, a delicate affair. The floats received a varnish coat, too, but with a slightly glossy finish, in order to underline the metallic surface. A relatively simple conversion, but effective and the Gladiator on floats does not look as fictional as I expected – even though the sheer height of the overall arrangement turned the otherwise sleek fighter aircraft into a pug-like utility vehicle, despite the relatively slender, single Fairey Firefox float. The Portuguese markings look good on it, too, adding to the exotic touch of this whif.